Every day, you throw away old food wrappers, paper towels, and other waste, hopefully sorting between the regular trash and recyclables. At the end of the week, you drag your bins to the curb to be picked up. But what happens after that? Are you sure that you’re sorting your trash and recycling correctly? And what exactly is the impact of recycling? 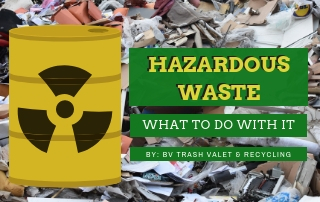 Homeowners often have a lot of questions about their trash and recycling, but might not know where to direct those questions. 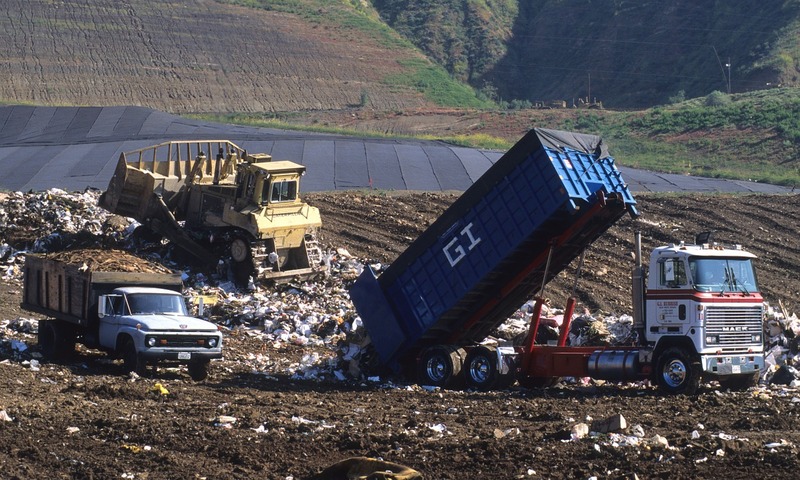 That’s why in this blog post, we’ll discuss some of the most frequent questions asked about trash and recycling. What Happens if Non-Recyclables End Up In the Recycling Bin? You’ve probably seen trash and recycling companies warn against cross-contaminating trash and recycling. If recyclables end up in your regular trash bin, of course, they simply don’t get recycled. But what if non-recyclable trash ends up in your recycling bin? 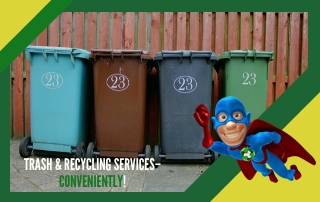 The problem is that often non-recyclable materials can contaminate your recyclables, making them unusable. This is especially true with food waste or chemical cleaner containers that haven’t been cleaned out. Why Are Some Recyclables Not Accepted At the Recycling Facility? Though it’s an easy mistake, don’t assume that everything marked recyclable will be accepted at your recycling facility. Sometimes — particularly with plastics — even if the item is labeled as recyclable, your recycling company might not accept it. Always check the number inside the recycling symbol. Some recycling companies only accept plastics 1 and 2. 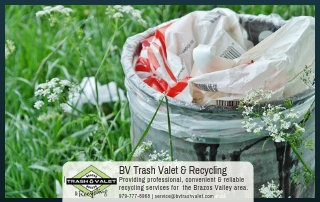 Brazos Valley Trash Valet & Recycling accepts plastics 1-7. Always check your recycling company’s list of acceptable materials. How Am I Billed For My Trash and Recycling Services? Obviously, the amount you pay and billing system will vary from provider to provider. 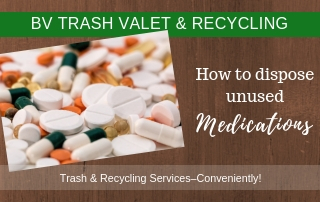 At Brazos Valley Trash Valet & Recycling, we charge $21.95/mo. You can subscribe through our website and pay through PayPal monthly. If you don’t have PayPal, you can pay for 6 months in advance with a $1 per month processing fee. Your recycling bin is complimentary. There are also separate rates for neighborhood communities or HOA associations. If you’re part of a group that uses our service, you can save significantly. Can I Cancel or Pause Services? You can cancel your trash and recycling pick-up at any time simply by unsubscribing. Because your payment is withdrawn automatically, you do want to ensure that you actually unsubscribe so that payments stop. But what if you just need a break while you go on vacation? If you’re not using your trash and recycling services, after all, you don’t want to be charged for them. If that’s the case, you can cancel and pick it back up later or you can speak with your trash and recycling provider about pausing services for a month or so. How Do I Contact My Trash and Recycling Provider? These are a few of the common questions we’re asked about trash and recycling services, but what if you have another question that’s not listed here? It’s important to keep the flow of communication open between you and your trash and recycling provider. 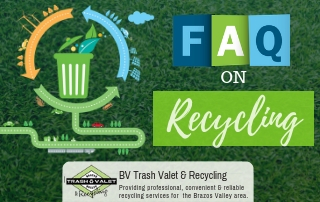 If you have any further questions, you can call Brazos Valley Trash Valet & Recycling at (979) 777-8968 or contact us online.